Before performing any maintenance work on your garage door, it's a good idea to let your family know, so they don't accidently open or close it until you are finished. This inspection should be performed once a month. Start by standing in the garage with the door closed. Take a quick look at the cables, rollers, springs and mounting hardware to check if something looks amiss. If you notice any signs of wear and tear or any frayed cables, it's best to have the door inspected by a trained professional. If your garage features an automatic opener system, you'll want to perform a photo eye test at least once a month. Open the door fully and place an object such as a brick or a broomstick in front of the photo eyes to break their infra-red beam. When you do that, the door should either refuse to close, or begin to reverse. This is also a test that you should try to perform every month, as any door that might be out of balance ought to receive a specialist's attention. To perform this test, disconnect the automatic opener while the door is closed. Next, try to open it manually – if you find it hard to do so, or if it does open but doesn't remain open, it might be out of balance. Lubrication is an essential part of your garage door's maintenance routine, so make sure you remember to do it at least twice a year. 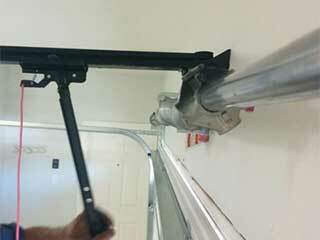 Apply a small amount of quality lubricant to the tracks, rollers, and hinges of the door. This test is essential for device equipped with an automatic opener system. The reverse mechanism resistance detection test is a way to make sure that you prevent possible entrapment. Open the door fully, and lay a brick or a piece of wood down on the floor at the centre of the opening. Now order the door to close. It should go into reverse as soon as when it touches the object. If it doesn't, it's time for a trained technician to have a look.